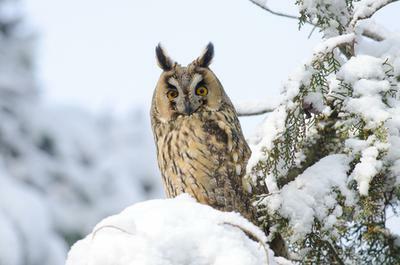 In early December of 2014 I first laid my eyes on the spectacular Long-eared Owl. The Owl was accompanied by its partner (presumably a male and female) and became residents of the small patchy forested areas adjacent to York University. On successive Nigh-birding outings throughout the winter the pair could readily be found hunting around the same territory, usually perched stoically on branches and street signs watching for movement. I was surprised by the consistency of the pairs appearance and longevity of their stay, which lasted up until the end of February. The Owls were a welcomed addition to the bland, bird-deprived winter environment of North York, and permitted much wanted fruitful birding excursions over many snowy months.